Just a short post tonight because I’ve been starting at the computer all day and I’m beat. Here’s a shot that I took of a really cool house/business (sometimes it’s hard to tell the difference) on Grand Avenue near downtown Phoenix. A lot of the houses have been turned into galleries, so I’m not really sure if someone was living here or not….but that didn’t stop me from setting up my tripod right outside the front door and getting this shot. Processing the brackets in Photomatix was a little bit of a challenge because of the movement in the bougainvillea in the foreground, but I think I got most of the ghosting cleaned up. Just didn’t have the patience to really stress over it tonight. But I love the colors in this shot, along with the shapes of the door and windows. I think the Christmas lights along the roofline are a nice touch as well! I’m trying to make up my mind about a photoshoot for this weekend…indoors or outdoors? Color or black-and-white? People or places? Early or late? Too many decisions to make, so I think I’ll put my tired brain to bed now. 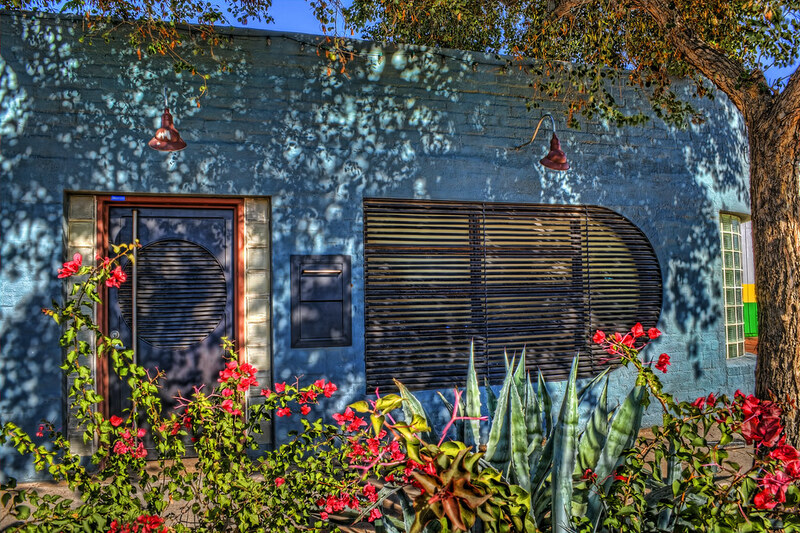 This entry was posted in Processing, Shooting and tagged architecture, Arizona, art deco, AZ, bougainvillea, building, camera, D5000, Grand Avenue, HDR, Nikon, Paint Shop Pro, Phoenix, photography, Photomatix, software, Topaz, tree, tripod. Bookmark the permalink.